If only the four gospels hadn’t been bound together. Of course, their authors had no idea that would happen—and how much damage it would bring to their credibility. Mark had no idea, for example, that Matthew would come along and add three chapters of supposedly ‘moral’ teachings, known to us as the Sermon on the Mount—and Matthew plagiarized about 90% of Mark, without mentioning his theft. Matthew had no idea that Luke would trim this Sermon considerably, and change the wording and setting (in Luke it’s at a ‘level place’). John decided to just leave it out. Everyone seems to have been playing pretty loose with the facts, and we can be highly skeptical that this sermon can be traced back to the peasant preacher from Galilee. Just how would have his words been preserved anyway? By some estimates, the illiteracy rate among the common folks at the time was about 95 percent. Nobody carried around pads of paper and pencils. Could his listeners have remembered and repeated with dead accuracy what Jesus said? And then the retelling of his words—countless time over five decades at least (until the composition of Matthew)—would have resulted in distortion and garbling. Or maybe Matthew just made it all up. Richard Carrier has pointed out that the Sermon on the Mount “…cannot have come from some illiterate Galilean. In fact, we know it originated in Greek, not Hebrew or Aramaic…these are not the words of Jesus. This famous sermon as a whole has a complex literary structure that can only have come from a writer, not an everyday speaker.” (On the Historicity of Jesus, pages 465 & 466) Since we don’t know Matthew’s sources—and we have little confidence that he had access to contemporary documentation—“these are not the words of Jesus” is not too harsh. We’re reading English translated from Greek, which is supposedly based on Aramaic oral tradition—well, New Testament scholars cling to this hope, for which there is scant evidence. Of course, defenders of Bible accuracy will resort to special pleading: these are God-inspired words, so we can trust them. But apologists really don’t want to go there. You don’t have to be a scholar to spot the defects. “God did it” amounts to blaming God for the sloppiness in the gospels. Is that really smart? But for those who want to hang on to the Sermon on the Mount—Yes, Jesus said it, and it has to be our moral compass—let’s see where that gets us. If only there was a way to get Christians to read the Sermon with as little ‘Jesus bias' as possible. Perhaps print the sermon on three or four sheets of paper, in modern, accurate translation that doesn’t sound 'too Bible'—and don’t tell them it’s the Sermon on the Mount. Ask them to use a red pen to grade it, putting big Xs beside the verses that don’t make sense, and that fall short as high moral principles. It would be hard to imagine a text that has been more universally ignored than this one. If we didn’t know better, we might have thought that Jesus foresaw how much Christians would despise and fight one another. For those of us who have been in charge of worship services, Matt 6:7 resonates—and has to be given a high rating: “When you are praying, do not heap up empty phrases as the Gentiles do; for they think that they will be heard because of their many words.” It is a common failing of clergy that they forget the distinction between preaching and praying—and we end up with really long-winded prayers, haranguing God and worshippers alike. Preachers should tack this verse up for easy reference when they’re composing the pastoral prayers. Of course, we can applaud the Golden Rule as stated in 7:12, “In everything do to others as you would have them do to you; for this is the law and the prophets.” But this maxim has been taught by many religious leaders before and after Jesus. Whoever created the Sermon of Mount—well, it’s no surprise that he added it. “Do not store up for yourselves treasures on earth, where moth and rust consume and where thieves break in and steal; but store up for yourselves treasures in heaven…” Christians who have pension plans know very well the risks of not storing up treasures on earth. “Store up treasures in heaven” is good copy for greeting cards, but in the real world, most Christians—those who don’t live in convents and monasteries—want to save for their futures in this life. So, please do store up treasure on earth. I’ve never met a Christian, not one, who takes this text seriously: Don’t worry about food because God feeds birds? Maybe they just shrug it off as pious Jesus-babble. After all, he expected the Son of Man to inaugurate the Kingdom of God before his generation passed away—and had no clue about the realities of life for centuries to come. Indeed, a case can be made—being overly generous, I think—that he was offering guidance for the short term, since the Kingdom was so near. ‘Turn the other cheek’ and ‘Go the extra mile’ can, of course, find qualified application, but I’ve never met Christians who think that Numbers 2, 4 & 5 are good guides for living. More impracticality from the Galilean preacher. Come on, we’re looking for guidance that reflects what we are, who we are, as human beings. It’s no good condemning people for lustful thoughts (5:27-28)—in fact, equating lust with adultery. It’s no good equating anger with murder (5:21-22). “Sinful thoughts” is one of the tools the church has used for inducing guilt: God is not just watching you, he’s inside your mind, checking up on you. And in Matthew 19, we find Jesus’ dreadful teaching about divorce; he equates it with adultery—except on grounds of unchastity. As portrayed in the gospels, Jesus has no clue that history was going to keep rolling along for centuries. This pronouncement about divorce has brought enormous anguish and suffering. Christians know it’s unrealistic, and they ignore it. 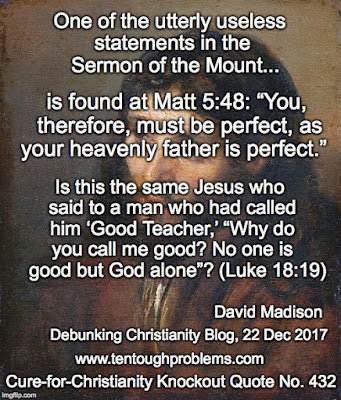 One of the utterly useless statements in the Sermon of the Mount is found at 5:48: “You, therefore, must be perfect, as your heavenly father is perfect.” Hmmm…is this the same Jesus who said to a man who had called him Good Teacher, “Why do you call me good? No one is good but God alone” (Luke 18:19). And Luke, by the way, didn’t think that “be perfect” was cool. He changed it to “be merciful, even as your father is merciful” (6:36). Christians sometimes say, “Without God, where would we get our morality? How would we know right from wrong?” They seem to assume that we can just read the Bible to find out. But that doesn’t work, does it? The pious have a habit of picking and choosing which Bible rules to take seriously; it is such a mash-up of conflicting rules, open to widely varying interpretations. “How would we know right from wrong without God?” For centuries, thinkers who haven’t been looking to the sky for answers have suggested lots of ways to know right from wrong. There are several worthwhile nuggets in the Sermon on the Mount, but keep it in perspective. The more you read it, the less persuasive it becomes. There are too many verses that beg too many questions, e.g. 5:13, 5:16 versus 6:2-4; 5:18, 5:22, 5:28, 5:59-30, 5:32, 5:37, 5:44, 6:15, 6:22-23, 6:28, 6:32, 6:34; 7:6, 7:8, 7:11, 7:13, 7:19, 7:22-23. Matthew 5-7 is ancient stab at guiding humans to better behavior, but, in addition to its shallow aphorisms, it is weighed down by too much religious gimmickry, e.g., the focus on heavenly reward, and the use of threat: “…and if you say, ‘You fool,’ you will be liable to the hell of fire” (Matt. 5:22). Really, can’t we do better than that? Those who regard this sermon as a Gold Standard—and applaud Jesus for it—overrate both.